The FLR-2000 Series Flow Meters and the FLV-2000 Series offer a solution for real-time metering and control of chemicals which are injected, pumped, dosed or dispensed. This flow measurent device is ideal for controlling chemical metering pumps and verifying their flow. Flow ranges of less than 0.07 GPH to 79.20 GPH at pressures from 20 to 250 PSI meet the general range of use in Water, Waste Water, Industrial, CPI, Food and Beverage, and Pharmaceutical marketplaces. The ±1% Full Scale accuracy insures precision. A 4 line x 20 character digital display enables the user to gather information, reset totalizer and input control commands within seconds. RS232, 0 to 5 Vdc, and relay outputs are standard. An advanced material coating process combined with a PVC body provide resistance to aggressive flow media. The wet side of the flow system is isolated from the electronics yet close coupled for easy installation, operation and maintenance. 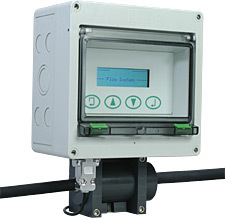 The FLV-2000 models allow the user to remotely set a pump rate or proportional valve setting. 참고: Comes complete with power supply and operator’s manual.